These days, we're used to royal weddings with a Cinderella angle: a prince or princess selects a commoner as a spouse, vaulting a person from a normal background into a world of crowns, thrones, and glamour. 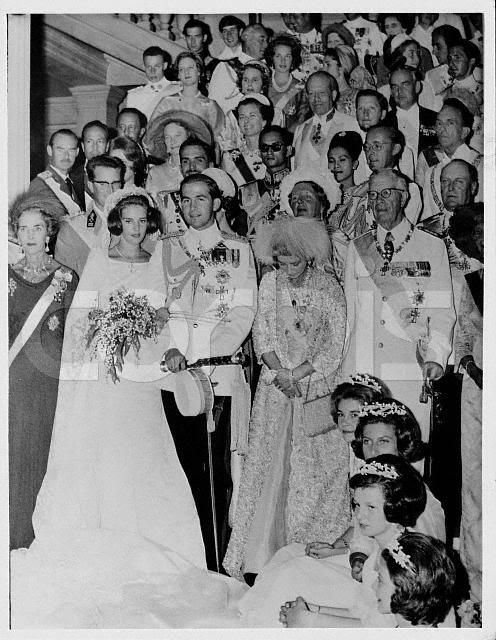 But in 1964, a royal wedding took place in Greece that hearkened back to the old dynastic world of royal marriages. 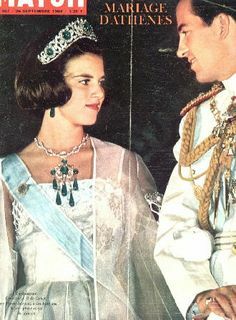 Fifty years ago today, the newly-ascended King Constantine II of the Hellenes gave his country a new queen when he married his third cousin, Princess Anne-Marie of Denmark. As you can imagine, this was one seriously glittering affair. Constantine was twenty-three; he's the only son of King Paul of the Hellenes and Princess Friederike of Hanover. His sisters are Sofia, who had married the future king of Spain two years earlier, and Irene, a Greek princess who is also a classically-trained pianist. Anne-Marie, the daughter of King Frederik IX of Denmark and Princess Ingrid of Sweden, had just turned eighteen. She was the youngest of a trio of Danish princesses; her sisters are Margrethe (now the Queen of Denmark) and Benedikte (now the Princess of Sayn-Wittgenstein-Berleburg). Constantine and Anne-Marie are both descendants of two of the most important dynastic monarchs of the nineteenth century: Queen Victoria of the United Kingdom and King Christian IX of Denmark. The young couple had to wait until Anne-Marie turned eighteen to wed. Two days before the wedding, a glittering pre-wedding gala was held in Athens. More than 1500 guests attended, including numerous royals. It was the first time that Anne-Marie wore Greek royal jewels in public. She donned the tiara from the Greek emerald parure. From the diamond necklace from her paternal grandmother's collection, she suspended the brooch from the emerald parure as a pendant. She also wore a pair of the emerald drops as earrings. The couple's mothers also wore serious jewels at the ball. Queen Friederike wore the grand diamond tiara that had belonged to her mother-in-law, Queen Sophie; she also wore the enormous sapphire pendant that had once been worn by Queen Marie of Romania. Queen Ingrid wore her heirloom ruby set, part of which was worn at the imperial coronation of Napoleon Bonaparte. Today, the rubies are worn by Crown Princess Mary of Denmark. For copyright reasons, I can't post pictures of the pre-wedding ball here, but I can tell you about some of the other tiaras that also appeared at the glittering gathering. Marie Jose, the former queen of Italy, wore her grand diamond tiara by Musy. Queen Juliana of the Netherlands wore the Stuart tiara. Queen Fabiola of the Belgians wore the tiara given to her by Generalissimo Franco in its floral wreath form. The Countess of Barcelona wore the diamond loop tiara. Queen Sofia of Spain, then still Princess Sofia, wore her diamond wedding tiara. Princess Claude d'Orleans, who had married Prince Amedeo of Savoy only weeks earlier, wore the family's diamond tiara with stars and Aosta knots. Can you imagine what it must have been like to stand in that ballroom?!? On her wedding day, Anne-Marie wore a tiara from her own family's collection. The diamond Cartier tiara, given by the Khedive of Egypt to Princess Margaret of Connaught as a wedding present in 1905, has been worn as a wedding tiara by all of the female descendants of Queen Ingrid. Anne-Marie eventually inherited the tiara from her mother. With her wedding gown and veil -- another heirloom of Margaret of Connaught -- Anne-Marie also wore a necklace with a cross pendant and her gold bracelet, another trinket worn by all of Ingrid's daughters, granddaughters, and great-granddaughters. The new queen's wedding dress was Danish, made by Jorgen Bender. I believe Bender also made the dresses for Anne-Marie's bridesmaids: Princess Irene of Greece and Denmark, Princess Christina of Sweden, Princess Anne of the United Kingdom, Princess Margarita of Romania, Princess Tatiana Radziwiłł, and Princess Clarissa of Hesse. The Greek orthodox wedding ceremony was held at the Metropolitan Cathedral in Athens. Golden wedding crowns held over the couple's head form a central part of the ceremony. Queen Friederike held the crowns; so did a number of European princes, including Crown Prince Harald of Norway (now King Harald V), Prince Carl Gustaf of Sweden (now King Carl XVI Gustaf), Prince Michael of Kent, and the Prince of Wales. 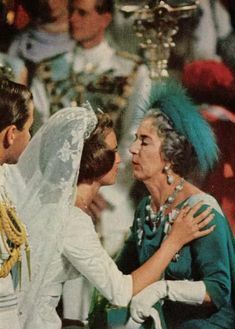 At the wedding, Queen Ingrid wore the Danish pearls; Queen Friederike wore a diamond necklace with a large pendant stone. Here's a view of the group photo taken after the ceremony. Fifty years, five children, and the end of the Greek monarchy later, Constantine and Anne-Marie are still married, living in Athens. This week, they've been celebrating their golden anniversary with family members in Greece. Congrats to them!